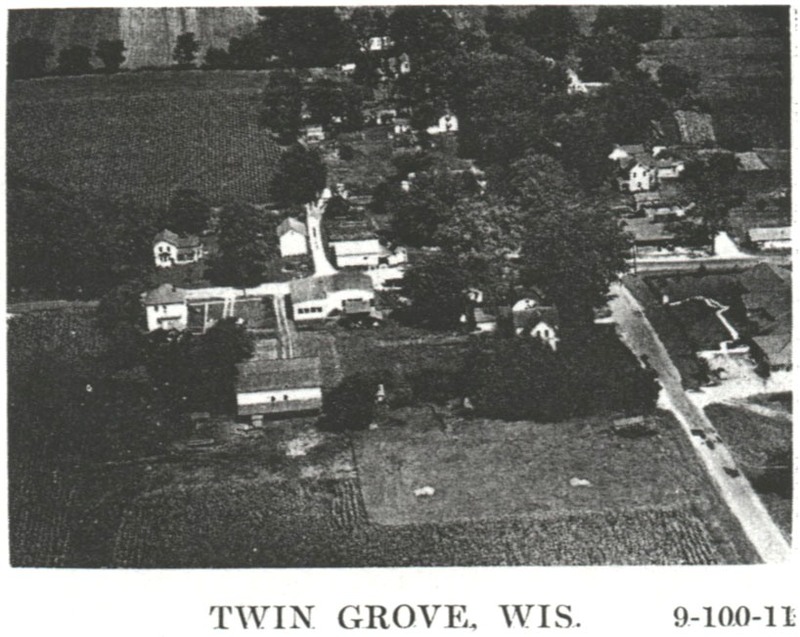 Twin Grove is located in Jefferson Township about two miles north of the Wisconsin-Illinois line at the intersection of highways "K" and "KK". The nearest town is Juda, which is about 6-7 miles northeast. Twin Grove's first start was in 1862, when Harrison CLEVENSTINE opened a store. Abraham SANBORN and Calvin HALE were the first settlers at Twin Grove. Jonathan HILL built the first frame house at the corners. Other early settlers were: Jonathan CABLE, J. A. CHAMBERS, J. S. BROWN, Joseph BELVEAL, E. J. BLACKFORD, Andrew and James W. RODERICK, Nathaniel PRESTON, Lewis ROUB, William BRADLEY, Isaac NEWMAN, and Joseph EMRICK. Extracted from the "History of Green County, Wisconsin" published by Union Publishing Company, Springfield, Ill. 1884; page 877.